Groups of 10 or more booking through to May 2020. Band A-B £34 | Band C-D or below £26. All discounts are subject to capping restrictions,not all seats can be discounts,discounts can be revoked at any time. For applicable performances 2nd December 2019-23rd May 2020 excluding December 23rd December 2019-5th January 2020. Standard Group 10+ Monday to Thursday 7.30pm,Wednesday 2.30pm,off peak performances. Bands A and B reduced to £36, and bands C-D reduced to £31. Standard Group Rate 10+(Friday 7.30pm,Saturday 2.30pm,and Monday to Friday performances and Saturday matinees in peak periods,except 23rd December 2019-4th January 2020. Bands A-B reduced to £44 and bands C-D reduced to £36. Groups 35+ Monday to Thursday performances off peak performances only. Bands A-B reduced to £34 and bands C-D reduced to £26. Peak Group Rate 10+ performances December 23rd-27th 2019 only. Band A reduced to £56, and Bands B-C reduced to £51. Discounts in this period will be strictly limited. Bands A-B reduced to £26 and bands C-D reduced to £21. Senior Groups 10+ Wednesday performances only at 2.30pm and 7.30pm excluding all peak periods and December 23rd 2019-4th January 2020. Band A reduced to £24. 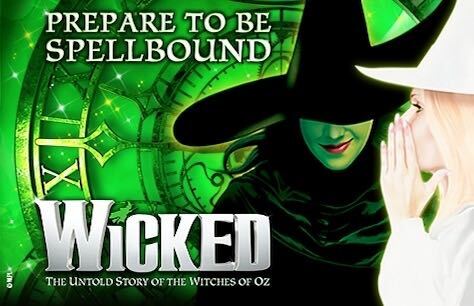 Need help making a Group Booking for Wicked?